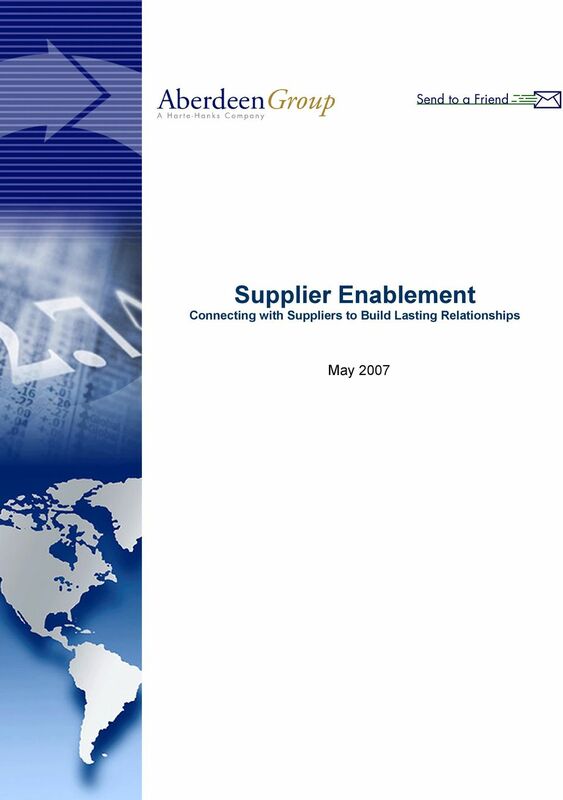 Download "Supplier Enablement Connecting with Suppliers to Build Lasting Relationships. 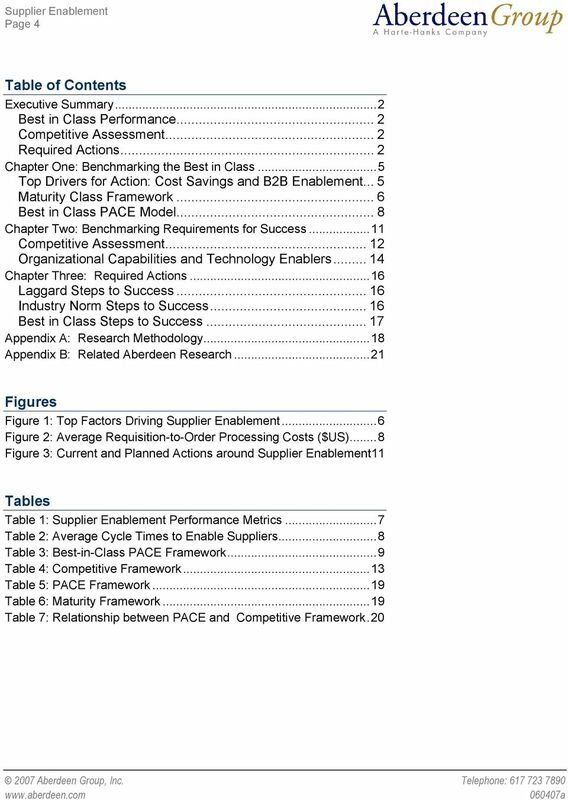 May 2007"
4 Page 5 Chapter One: Benchmarking the Best in Class T he disconnect between an enterprise and its suppliers can present a wealth of problems (and headaches) for any procurement division. Supply chain disruptions, insufficient or lack of appropriate supplier information, revenue leakage and missed cost savings are genuine issues that are plaguing companies much too frequently. Organizations ultimately lack a high degree of visibility in to the interactions with suppliers, placing these supplier relationships at risk. Connecting suppliers to an enterprise s supply chain, known as enabling, can help to ensure that companies meet customer demand by procuring materials at the right speed for the right cost. 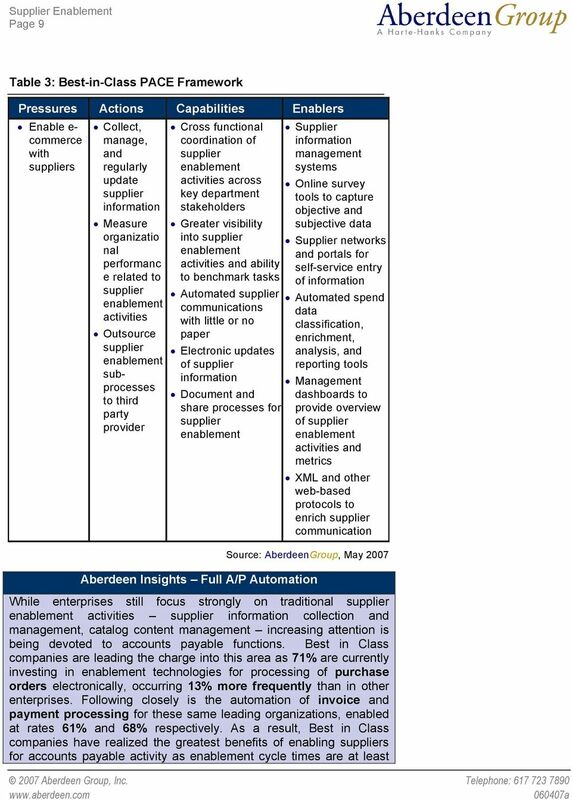 Supplier enablement encompasses many different facets of the source-to-settle cycle, including: Automated collection and self-service provision of supplier information Supplier data cleansing and classification Catalog content management, including third party hosting and punch-out capability Electronic communication about and processing of purchase orders (POs), invoices, and payments Strategic sourcing activities such as erfx and online auctions The majority of enterprises represented in our survey pool (53%) have indicated that supplier enablement is a high priority task for their respective procurement departments in 2007 Previous Aberdeen research discovered that although the number one and three challenges for CPOs may shift between people and spend, the number two challenge is always a constant - suppliers. 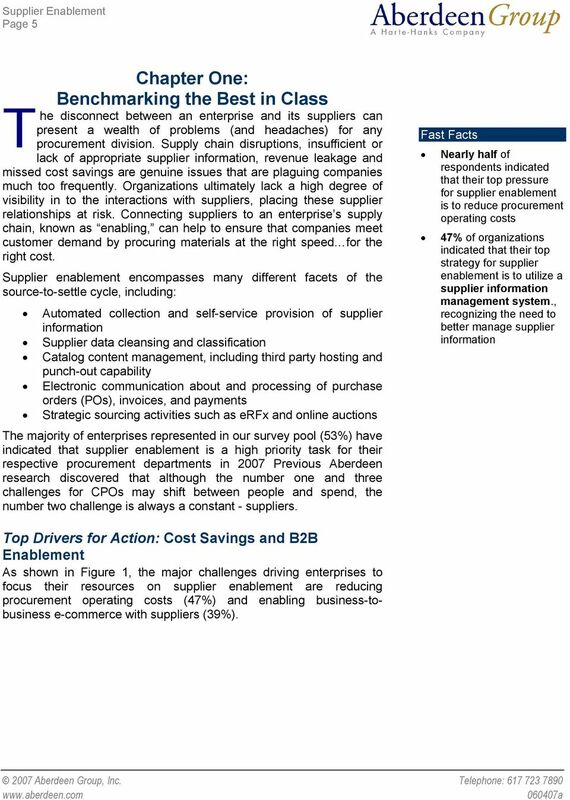 Fast Facts Nearly half of respondents indicated that their top pressure for supplier enablement is to reduce procurement operating costs 47% of organizations indicated that their top strategy for supplier enablement is to utilize a supplier information management system., recognizing the need to better manage supplier information Top Drivers for Action: Cost Savings and B2B Enablement As shown in Figure 1, the major challenges driving enterprises to focus their resources on supplier enablement are reducing procurement operating costs (47%) and enabling business-tobusiness e-commerce with suppliers (39%). 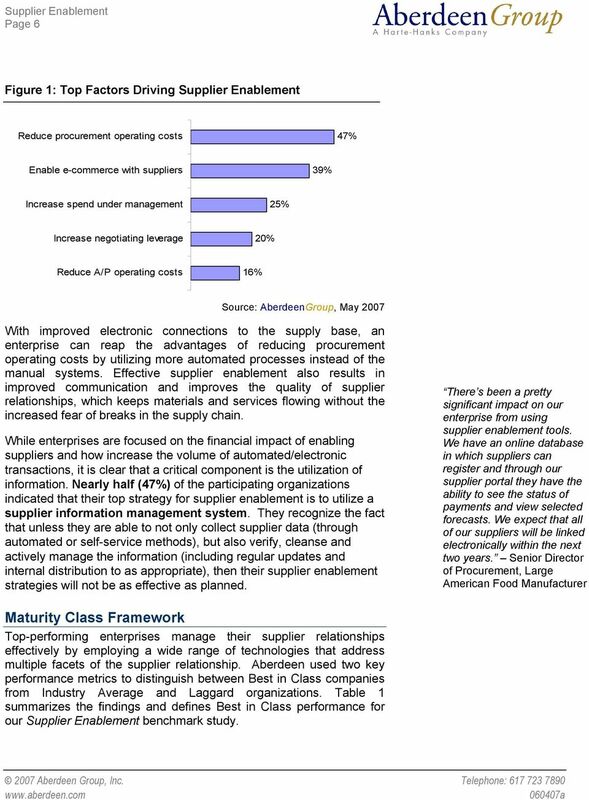 5 Page 6 Figure 1: Top Factors Driving Supplier Enablement Reduce procurement operating costs 47% Enable e-commerce with suppliers 39% Increase spend under management 25% Increase negotiating leverage 20% Reduce A/P operating costs 16% Source: AberdeenGroup, May 2007 With improved electronic connections to the supply base, an enterprise can reap the advantages of reducing procurement operating costs by utilizing more automated processes instead of the manual systems. Effective supplier enablement also results in improved communication and improves the quality of supplier relationships, which keeps materials and services flowing without the increased fear of breaks in the supply chain. While enterprises are focused on the financial impact of enabling suppliers and how increase the volume of automated/electronic transactions, it is clear that a critical component is the utilization of information. Nearly half (47%) of the participating organizations indicated that their top strategy for supplier enablement is to utilize a supplier information management system. They recognize the fact that unless they are able to not only collect supplier data (through automated or self-service methods), but also verify, cleanse and actively manage the information (including regular updates and internal distribution to as appropriate), then their supplier enablement strategies will not be as effective as planned. There s been a pretty significant impact on our enterprise from using supplier enablement tools. We have an online database in which suppliers can register and through our supplier portal they have the ability to see the status of payments and view selected forecasts. We expect that all of our suppliers will be linked electronically within the next two years. Senior Director of Procurement, Large American Food Manufacturer Maturity Class Framework Top-performing enterprises manage their supplier relationships effectively by employing a wide range of technologies that address multiple facets of the supplier relationship. Aberdeen used two key performance metrics to distinguish between Best in Class companies from Industry Average and Laggard organizations. 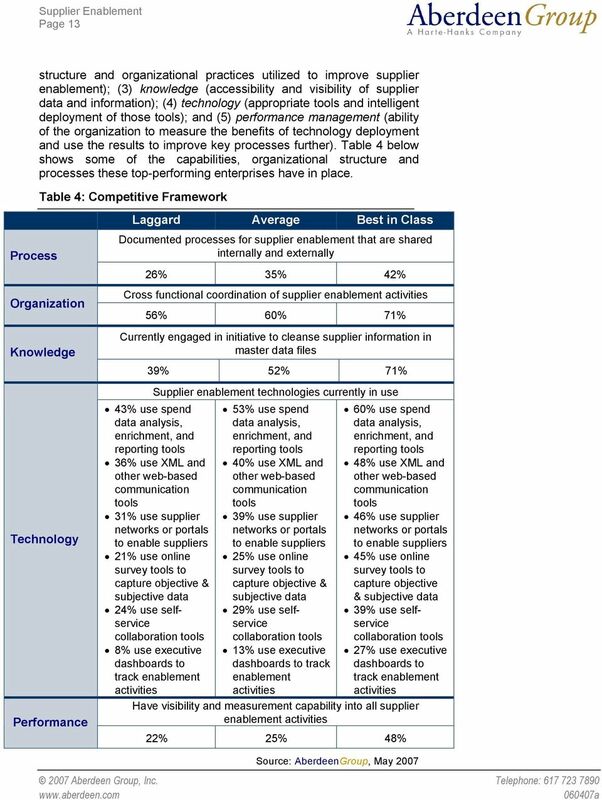 Table 1 summarizes the findings and defines Best in Class performance for our Supplier Enablement benchmark study. 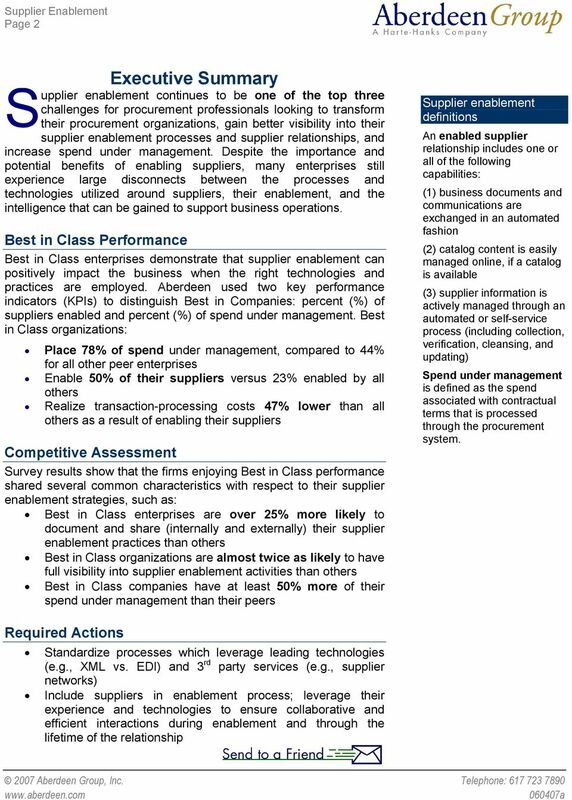 6 Page 7 Table 1: Supplier Enablement Performance Metrics Definition of Maturity Class Percent Suppliers Enabled Percent Spend Under Management Best in Class: Top 20% of aggregate performance scorers Industry Average: Middle 50% of aggregate performance scorers Laggard: Bottom 30% of aggregate performance scorers 50% 78% 28% 50% 10% 39% Source: AberdeenGroup, May 2007 Best in Class enterprises clearly outperform other enterprises across key supplier enablement metrics. Most importantly, they enable five times more of their supply base compared to Laggard organizations, leading to distinct advantages in other areas of measurement for enablement. By enabling more of their suppliers, Best in Class companies are able to process more of the transactions in the procure-to-pay cycle electronically as opposed to using manual, paper-based methods. Electronic processing of POs, invoices, and payments occurs at least 30% more frequently in Best in Class organizations compared to all others, resulting in improved transaction processing cycle times and cost savings. A significant benefit of enabling more suppliers is to drive more spend under the management of procurement; Best in Class enterprises manage at least 1.5 times more of their spend through procurement than Average and Laggard enterprises. This leads to greater visibility into and increased ability to analyze and report on this spend, which subsequently allows an organization to leverage opportunities for spend aggregation and cost savings. 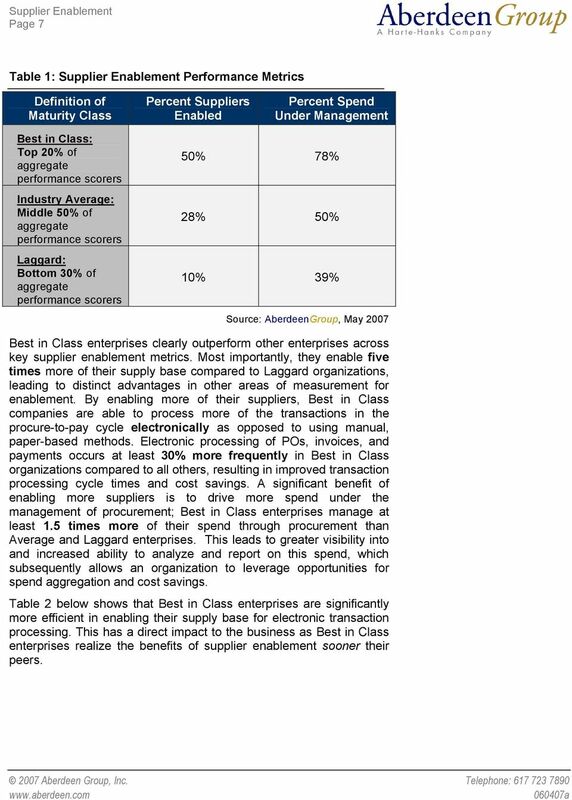 Table 2 below shows that Best in Class enterprises are significantly more efficient in enabling their supply base for electronic transaction processing. This has a direct impact to the business as Best in Class enterprises realize the benefits of supplier enablement sooner their peers. 7 Page 8 Table 2: Average Cycle Times to Enable Suppliers Best in Class (Days) All Others (Days) Enablement of electronic POs Enablement electronic invoices Source: AberdeenGroup, May 2007 Savings Opportunity In addition to improvements in cycle time for enablement and increasing the percentage of transactions conducted electronically, Best in Class enterprises also realize significantly lower transaction costs as a result of supplier enablement. Best in Class organizations are able to drive down their costs 71% lower than before supplier enablement strategies were deployed, while also realizing an average cost that is over 45% lower than their peers (Figure 2). 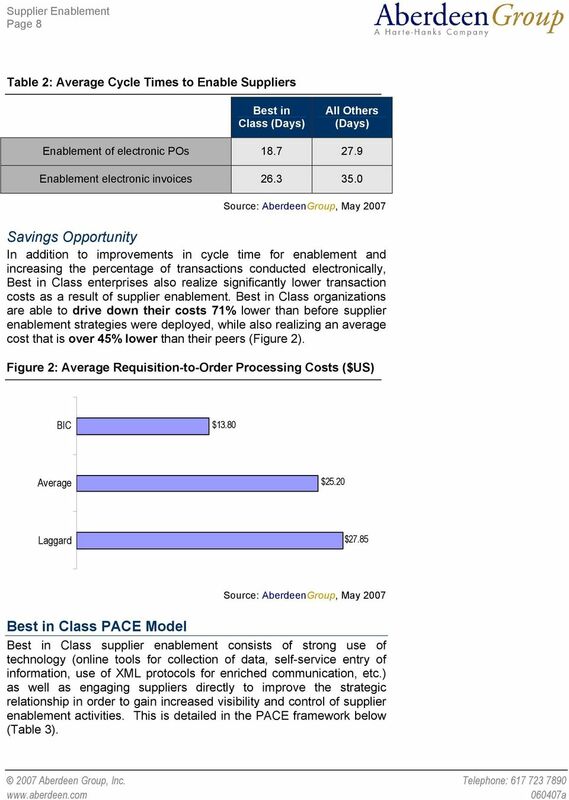 Figure 2: Average Requisition-to-Order Processing Costs ($US) BIC $13.80 Average $25.20 Laggard $27.85 Source: AberdeenGroup, May 2007 Best in Class PACE Model Best in Class supplier enablement consists of strong use of technology (online tools for collection of data, self-service entry of information, use of XML protocols for enriched communication, etc.) as well as engaging suppliers directly to improve the strategic relationship in order to gain increased visibility and control of supplier enablement activities. This is detailed in the PACE framework below (Table 3). 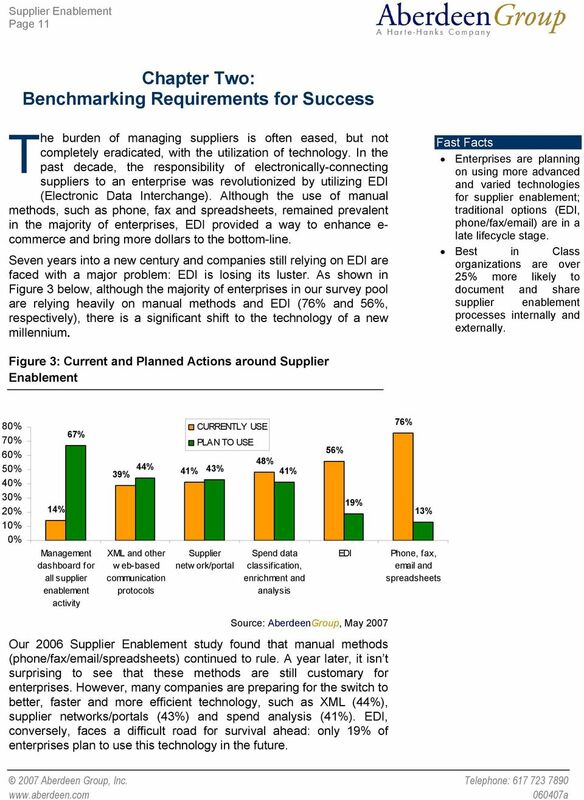 9 Page 10 Aberdeen Insights Full A/P Automation 20% lower than those of other enterprises. Recent Aberdeen research also identified invoice processing cost savings of 74% to 89% for electronic instead of paper invoice transactions for all organizations. Case Study: Accounts Payable Enablement A global pharmaceutical company undertook an initiative to transition all of its suppliers for North American operations to electronic transactions by The challenge involved enabling over 2300 suppliers for two different organizational groups (procurement and accounts payable) operating two different systems. Utilizing an ondemand solution and off-shore enablement support, the enterprise was able to use the supplier enablement tools within 48 hours of project kick-off. Enablement results included: 350 suppliers enabled for e-invoicing within 12 weeks 450 suppliers enabled for EFT within 8 weeks Vendor master data for over 1500 suppliers was updated in 6 weeks The technology solution selected provided integrated workflow, supplier self-service, and automated communications functionality for rapid deployment. Additionally, a layer of visibility was added through the use of online dashboards. 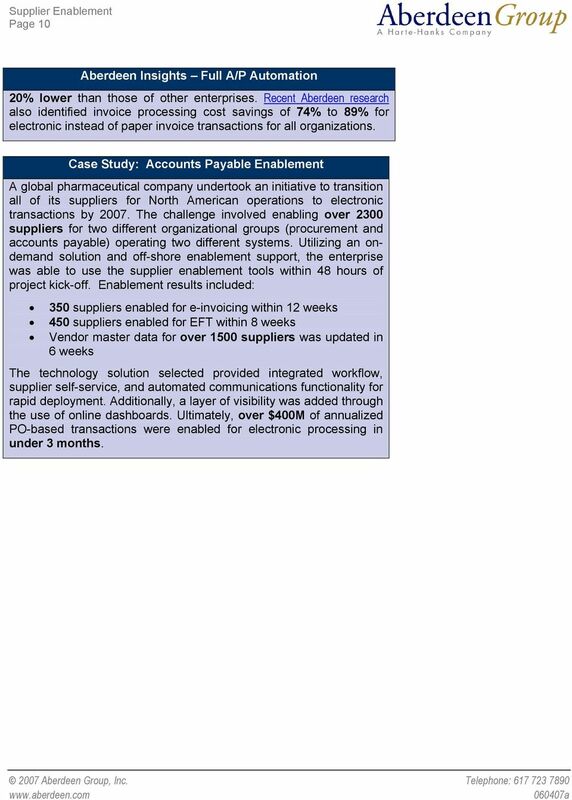 Ultimately, over $400M of annualized PO-based transactions were enabled for electronic processing in under 3 months. 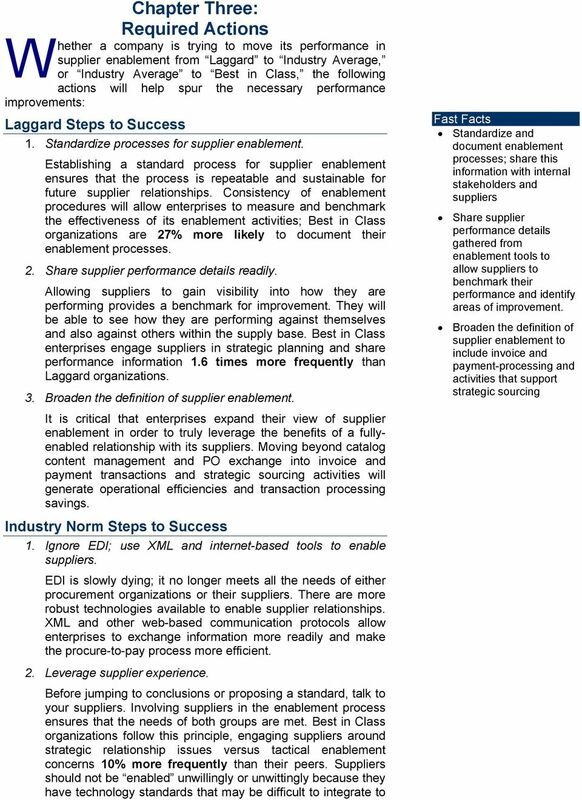 10 Page 11 Chapter Two: Benchmarking Requirements for Success T he burden of managing suppliers is often eased, but not completely eradicated, with the utilization of technology. In the past decade, the responsibility of electronically-connecting suppliers to an enterprise was revolutionized by utilizing EDI (Electronic Data Interchange). Although the use of manual methods, such as phone, fax and spreadsheets, remained prevalent in the majority of enterprises, EDI provided a way to enhance e- commerce and bring more dollars to the bottom-line. Seven years into a new century and companies still relying on EDI are faced with a major problem: EDI is losing its luster. As shown in Figure 3 below, although the majority of enterprises in our survey pool are relying heavily on manual methods and EDI (76% and 56%, respectively), there is a significant shift to the technology of a new millennium. Fast Facts Enterprises are planning on using more advanced and varied technologies for supplier enablement; traditional options (EDI, phone/fax/ ) are in a late lifecycle stage. Best in Class organizations are over 25% more likely to document and share supplier enablement processes internally and externally. Figure 3: Current and Planned Actions around Supplier Enablement 80% 70% 60% 50% 40% 30% 20% 10% 0% 14% 67% Management dashboard for all supplier enablement activity 48% 44% 43% 39% 41% 41% XML and other w eb-based communication protocols CURRENTLY USE PLAN TO USE Supplier netw ork/portal Spend data classification, enrichment and analysis 56% 19% EDI 76% 13% Phone, fax, and spreadsheets Source: AberdeenGroup, May 2007 Our 2006 Supplier Enablement study found that manual methods (phone/fax/ /spreadsheets) continued to rule. A year later, it isn t surprising to see that these methods are still customary for enterprises. However, many companies are preparing for the switch to better, faster and more efficient technology, such as XML (44%), supplier networks/portals (43%) and spend analysis (41%). EDI, conversely, faces a difficult road for survival ahead: only 19% of enterprises plan to use this technology in the future. 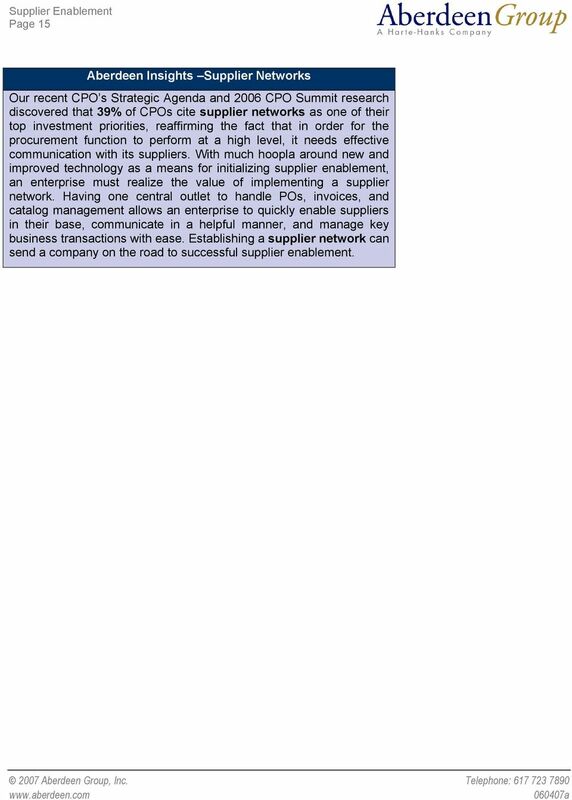 14 Page 15 Aberdeen Insights Supplier Networks Our recent CPO s Strategic Agenda and 2006 CPO Summit research discovered that 39% of CPOs cite supplier networks as one of their top investment priorities, reaffirming the fact that in order for the procurement function to perform at a high level, it needs effective communication with its suppliers. With much hoopla around new and improved technology as a means for initializing supplier enablement, an enterprise must realize the value of implementing a supplier network. Having one central outlet to handle POs, invoices, and catalog management allows an enterprise to quickly enable suppliers in their base, communicate in a helpful manner, and manage key business transactions with ease. Establishing a supplier network can send a company on the road to successful supplier enablement. 16 Page 17 the enablement tools selected. In fact, the technological capabilities of some suppliers far surpass that of most buying organizations. 3. Focus on self-service and automation of enablement activities. Best in Class enterprises utilize online, self-service collaboration and survey tools for data collection over 40% more frequently than others. Self-service and automated supplier enablement strategies ensure supplier information is more quickly and accurately assimilated into master data files. Transaction processing from these suppliers becomes more efficient and less costly manual updates and changes of supplier information are no longer required. However, selfservice and automated solutions should not serve as a surrogate for personal interaction with suppliers. These strategies merely make the personal interactions more focused and effective. Best in Class Steps to Success 1. Ignore the 80/20 rule for supplier enablement. Enterprises often focus their enablement and relationshipbuilding efforts on the 20% of suppliers that comprise 80% of their revenue. Yet, the remaining 80% of the supply base often constitutes the majority of problems related to supplier interactions. 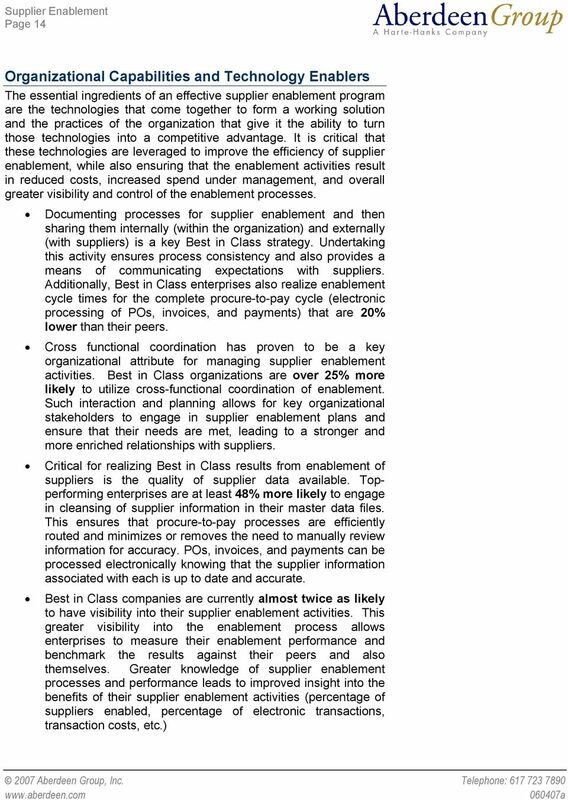 Best in Class companies enjoy significant advantages in transaction processing costs and enablement cycle times exactly because they address more of their supply base 50% of the supply base for Best in Class organizations are enabled compared to only 23% for their peers. 2. Leverage incremental BPO strategies. As definitions of supplier enablement broaden, the technology and services available also continue to develop and become more robust. 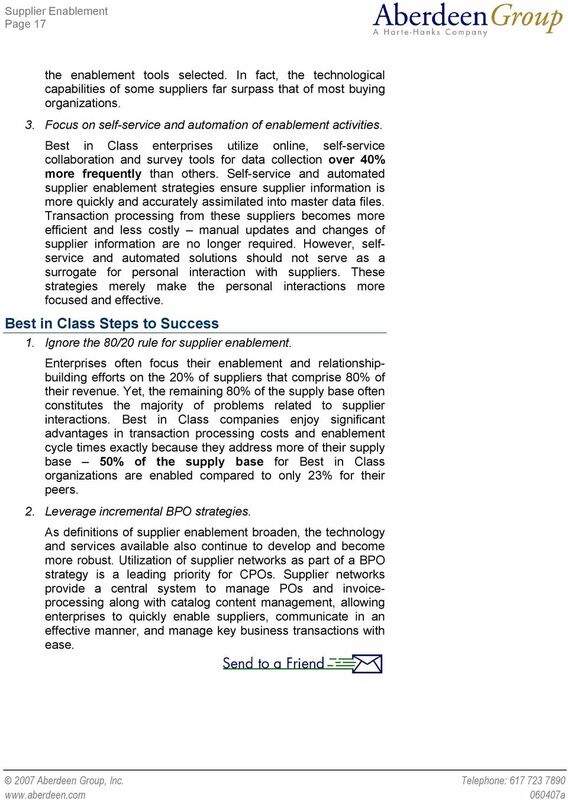 Utilization of supplier networks as part of a BPO strategy is a leading priority for CPOs. Supplier networks provide a central system to manage POs and invoiceprocessing along with catalog content management, allowing enterprises to quickly enable suppliers, communicate in an effective manner, and manage key business transactions with ease. 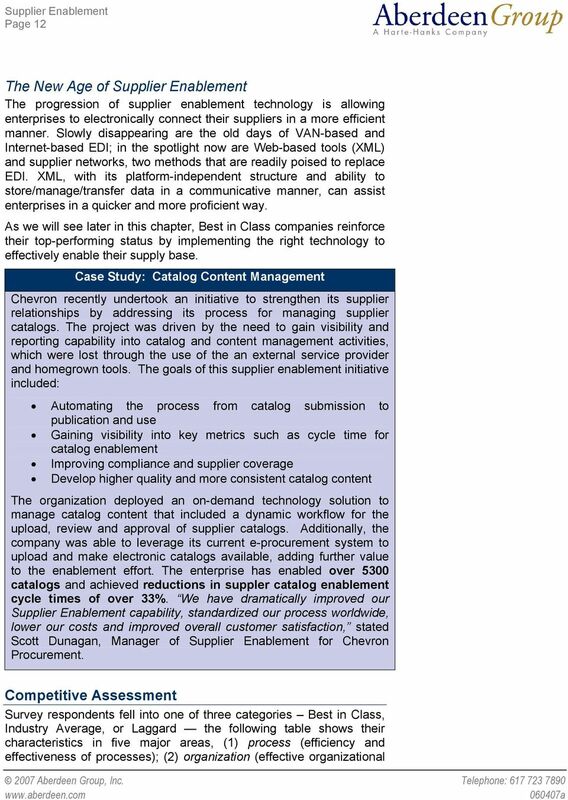 18 Page 19 Supplier Enablement Benchmark Report. Their sponsorship has made it possible for Aberdeen Group to make these findings available to readers at no charge. 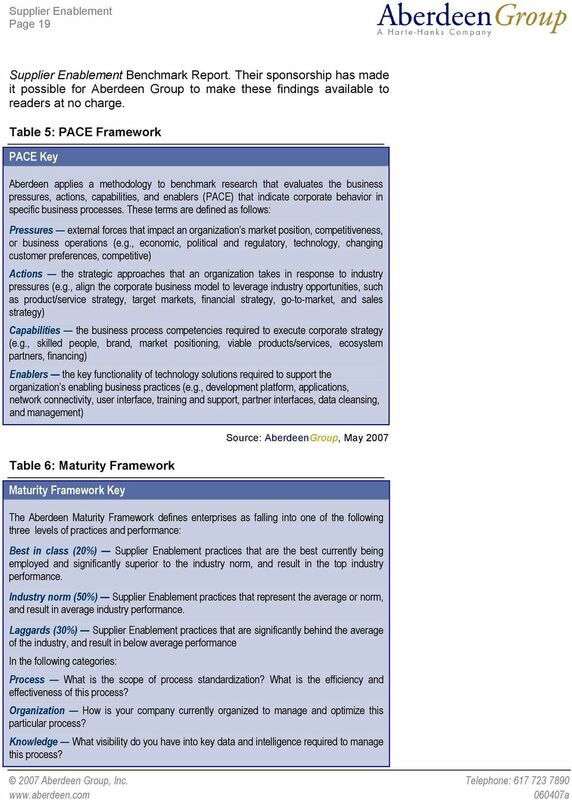 Table 5: PACE Framework PACE Key Aberdeen applies a methodology to benchmark research that evaluates the business pressures, actions, capabilities, and enablers (PACE) that indicate corporate behavior in specific business processes. These terms are defined as follows: Pressures external forces that impact an organization s market position, competitiveness, or business operations (e.g., economic, political and regulatory, technology, changing customer preferences, competitive) Actions the strategic approaches that an organization takes in response to industry pressures (e.g., align the corporate business model to leverage industry opportunities, such as product/service strategy, target markets, financial strategy, go-to-market, and sales strategy) Capabilities the business process competencies required to execute corporate strategy (e.g., skilled people, brand, market positioning, viable products/services, ecosystem partners, financing) Enablers the key functionality of technology solutions required to support the organization s enabling business practices (e.g., development platform, applications, network connectivity, user interface, training and support, partner interfaces, data cleansing, and management) Table 6: Maturity Framework Maturity Framework Key Source: AberdeenGroup, May 2007 The Aberdeen Maturity Framework defines enterprises as falling into one of the following three levels of practices and performance: Best in class (20%) Supplier Enablement practices that are the best currently being employed and significantly superior to the industry norm, and result in the top industry performance. Industry norm (50%) Supplier Enablement practices that represent the average or norm, and result in average industry performance. Laggards (30%) Supplier Enablement practices that are significantly behind the average of the industry, and result in below average performance In the following categories: Process What is the scope of process standardization? What is the efficiency and effectiveness of this process? Organization How is your company currently organized to manage and optimize this particular process? Knowledge What visibility do you have into key data and intelligence required to manage this process? 20 Page 21 Appendix B: Related Aberdeen Research Related Aberdeen research that forms a companion or reference to this report include: E-Payables: Advancing A/P Automation, March 2007 The CPO s Strategic Agenda: Managing Performance, Reporting the CFO, February 2007 The CPO s Strategic Agenda: Managing People, Managing Spend, November 2006 The e-procurement Benchmark Report, August, 2006 The Supplier Enablement Benchmark Report, March 2006 Information on these and any other Aberdeen publications can be found at Aberdeen s 2007 Global Supply Management Research Agenda is also available. Subscribe to the Global Supply Management RSS FEED at: Authors: William Browning III, Research Analyst, Global Supply Management Christopher Dwyer, Research Editor, Global Supply Management Andrew Bartolini, Research Director, Global Supply Management Founded in 1988, Aberdeen Group is the technology- driven research destination of choice for the global business executive. Aberdeen Group has over 100,000 research members in over 36 countries around the world that both participate in and direct the most comprehensive technology-driven value chain research in the market. Through its continued fact-based research, benchmarking, and actionable analysis, Aberdeen Group offers global business and technology executives a unique mix of actionable research, KPIs, tools, and services. This document is the result of research performed by Aberdeen Group. Aberdeen Group believes its findings are objective and represent the best analysis available at the time of publication. 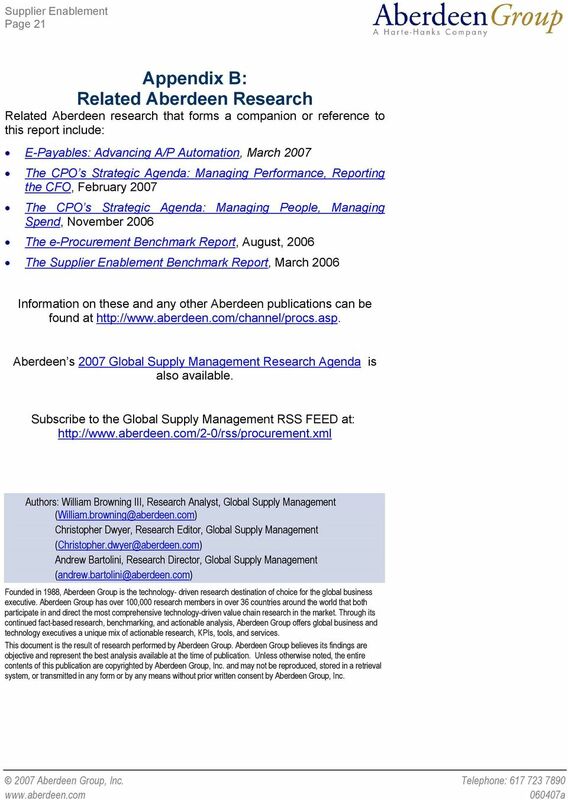 Unless otherwise noted, the entire contents of this publication are copyrighted by Aberdeen Group, Inc. and may not be reproduced, stored in a retrieval system, or transmitted in any form or by any means without prior written consent by Aberdeen Group, Inc.
Unlocking Value in Source-to-Pay. Customer Success. Realize Customer Success through Transformation and Cloud Software. Cloud Software. CHANGE PAPER BEYOND PAPERLESS How AP Change Makers can improve on scan and capture solutions to unlock the full potential of AP Automation March 2014 TABLE OF CONTENTS 1. AP AUTOMATION WHERE ARE YOU TODAY?